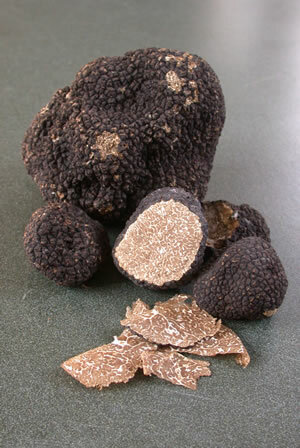 Truffles are the “fruit” of fungi that live in mutually beneficial (ectomycorrhizal) symbioses with the roots of host trees. The truffle fungus explores the soil for water and mineral nutrients, which it passes along to the tree. In exchange, the tree provides sugars produced through photosynthesis to the fungus. The tree and the fungus depend on one another, but there are many tree species that can serve as hosts for the truffles, and many fungi that can fulfill the same role for the tree. In nature, these fungi compete for space on the host tree’s root system. This competition limits truffle production, and if conditions are poor, other fungi can displace the truffle fungus from the root system. Because it is not possible to weed-out competing fungus species, the strategy behind truffle cultivation is to provide the truffle fungus with the conditions it needs to prevail in the competition against other fungi. This competitive advantage is given to the truffles in several ways: through careful site selection, planting inoculated seedlings, and creating soil conditions better suited to truffles than other fungi. With a good site and good quality seedlings, the establishment and management of a truffiere is straightforward and potentially profitable even on a small scale. Seedlings inoculated while they are still in the nursery give the truffles the advantage of being there first. It is more difficult for other fungi to become established on roots that are already colonized. This factor, by itself, allows European farmers to cultivate truffles within their native habitat, despite the presence of many other fungus species well adapted to the same soil conditions. In North America, it is often necessary to add lime to raise the soil pH. This simple process creates dramatic changes in soil chemistry that the European truffles need while simultaneously putting North American fungi adapted to low pH conditions at a competitive disadvantage. This is an advantage that European truffle farmers do not have. Finally, most ectomycorrhizal fungi associate with a limited range of trees and many North American fungi cannot associate with the European trees that we inoculate. In some cases, particularly in the Western U.S., it is possible to plant hosts that lack closely related species in the surrounding flora. This factor reduces the number of native fungus species that are even capable of competing for space on the host tree’s roots. Altogether, with unusual soil chemistry, non-native hosts and already colonized roots, the truffles may escape from effective competition. In the plant and animal worlds, many introduced species flourish in the absence of native competitors and predators. The same may be true for truffles outside their natural habitat.